Ben Affleck and Jennifer Garner have been married almost 8 years now, and at the outset, they appear to be blissfully married, right? But of course, they are the perfect couple, taking their children to ballet class, portraying the image of the perfect family. 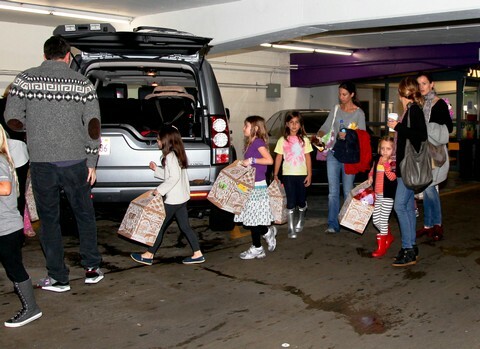 They wouldn’t call the paparazzi to take pictures of them at their daughter’s school, of course they wouldn’t. That would be invasion of privacy, and they are VERY against that, didn’t you know? Please. An Oscar campaign is like a government campaign – you do everything and anything necessary to get the votes from Academy members. Ben and Jennifer had to portray the image of the perfect family, because if the Academy thought otherwise, he might have lost a lot of votes. But of course, that didn’t stop him from insulting his wife in front of millions and millions of viewers when he finally won that Oscar. He wouldn’t have won if it weren’t for her willingness to play her part, yet when it’s his turn to thank her, he says, “I want to thank my wife, I want thank you for working on our marriage for ten Christmases, it’s- uh, it’s- it’s good, it is work, but it’s the best kind of work, and, uh, there’s no one I’d rather work with.” Way to profess your love and gratitude there, Ben. He later tried to make up for his words by telling Access Hollywood, “All marriages, all relationships to a certain extent, require your work. They require work and investment. We work on it together, we try our best, nobody’s perfect. I would be lying to you if I said that either she or I were.” Well, if anything, that made it worse, not better. Who on Earth would go up on stage after winning the biggest prize in their industry and then saying, “Oh my god, it’s like, SO HARD, being married to my wife.” Because for all intents and purposes, that’s exactly what he said. And let’s explore that, shall we. Why exactly is it so damn hard being married to his wife? Is it because he’s been so (ahem) faithful in the past, that he has to work to make up for his transgressions? It it because it’s soooo hard for him to stay faithful to his wife of seven years despite her [seemingly] endless devotion? Is it because she threatened to leave him when the rumors about him cheating went viral? And really, Jennifer’s no better. Why does she have to put up with this? Oh, I’ll tell you why – if she did leave Ben Affleck, sure she would probably make a big mess of his public image at first. But then, her A-list status would slowly sink away. Think about it – what have her last few movies been? The Odd Life of Timothy Green, Butter, Valentine’s Day, The Invention of Lying, and Ghosts of Girlfriends Past. Not exactly what you would call good movies, nor ones with a high star caliber. If she were to divorce Ben, her claim to fame would literally be a bunch of B-grade movies and the ex-wife of an Oscar winning producer. So of course, she agrees to trot their children around when it’s necessary, and agrees to be the perfect political wife. And if he ends up making a run for government office in the future, like he’s rumored to be planning, all the better. Look, we know it’s not nice to make judgments on other people or their relationships. But when it’s this hypocritical, it’s hard not to. It’s almost crazy to believe that he’s best friends with Matt Damon; Matt, who’s selflessly devoted to his wife and says nothing but amazing things about her, who is never in the spotlight unless he’s promoting something, who is never seen with his children or wife unless it’s at for a public event. Do you even know the name of Matt’s children? Exactly.